Hello, I’m back! It has been a long time and I have spent most of it adjusting to the Oregon winter weather (rain). I have done some recent traveling and photographing and want to share the experience with you. The big trip we, my wife and I, took was to Salt Lake City to visit my daughter Jessica for a few days and then we travelled to Zion National Park. 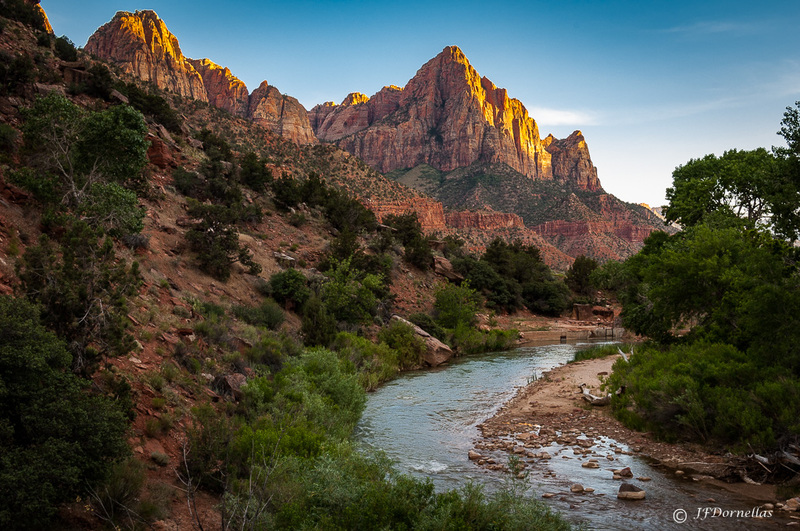 Utah is the home of 5 national parks, one of them being Zion, and Several National Monuments making it a photographic wonderland. You could spend several months there and probably not get to see all the wonders of this state. Zion National Park is an incredible place and we spent most of our time in the Canyon with spectacular cliffs, huge rock formations and the Virgin River running through it. Since it is a canyon there are not many opportunities to capture Sunrise and Sunset hotos, I did manage to capture one image of the Watchman at sunset. Over the week that we were there the temperature ranged from 100 to 107 degrees so we spent the mornings and evenings in the park when it was the coolest. We did the River Walk which ends at the entrance to the Narrows. We thought about hiking the Narrows, which is a hike through a narrow canyon walking all the way in the Virgin River. The river can be as high as your chest at times or only up to your knees but the hike ends into a wide open canyon and is spectacular. I could not get my head around managing my camera equipment, a tripod and hiking sticks through the canyon. The hiking sticks are needed to check the bottom of the river for large rocks and holes as you walk so you don’t fall in. The trip was great and I had some success with images from this great park. Another short trip I took after we came back was to the Columbia Gorge with some spectacular views and many waterfalls. The gorge follows the Columbia River and is what separates Oregon and the state of Washington. I did manage to come back with what I considered to be 2 good images. I went on a cloudy and rainy day so I couldn’t get a sunrise or sunset image, so this is probably going to be a trip I make several times. 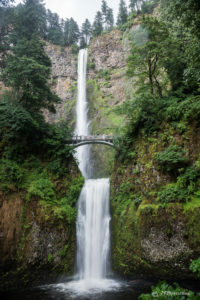 The images below are of the view of the Gorge from the Portland Women’s Forum Park and of Multnomah Falls one of the most photographed falls and the second tallest waterfall in the US. I hope to have more posts over the next few months and keep posting over the fall and winter. This entry was posted in Landscape Photography on July 18, 2016 by admin.